17 B 108 Private, Mellen, Sidney Removed from Middletown.
" " 113 " Murry, William K 32 Infantry, Removed from Weverton.
" C 138 " Murphy, James B. E 12 " Oct. 25, 1862 Removed from Frederick.
" " 144 Corporal, McCarty, John K 2 " Dec. 28,1862 "
" " 174 " McLay, James 2 " Oct. 5, 1862 Removed from Frederick.
" " 182 " Merans, James H. D 12 " Feb. 19, 1862 "
" " 183 " Mahon, Walter E 34 " Aug. 24, 1864 Removed from Clarysville.
" B 124 " Nicholson, Francis M. G 28 " Sept. 17, 1862 Removed from Hagerstown.
" " 147 " Nulty, John C 28 " Jan. 20, 1863 Wounded Sep. 17th, 1862.
" A 9 " Perry, Charles F 15 " Sept. 17, 1862 Removed from Antietam battle-field.
" B 102 " Poole, E. G. G 12 " Oct. 14, 1862 Removed from Smoketown.
" C 142 " Pilv or Pike, George W. J 37 " Nov. 19, 1862 Removed from Frederick.
" " 150 " Picket, Thomas I 29 " Mar. 20, 1863 "
" " 158 " Pottenheimer, W. H 34 " Aug. 14, 1864 "
" " 165 " Payzant, Lewis C 2 " Mar. 6, 1865 "
" " 166 " Palmer, Thomas B 2 " Mar. 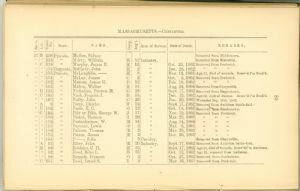 25, 1865 "
" " 175 " Pierce, James H 2 Dec. 26, 1861 "
" " 184 " P----, John 3 Cavalry, Removed from Clarysville.
" " 92 " Reed, Silas L. D 35 " Oct. 12, 1862 Age 25, removed from Antietam.
" " 99 " Remich, Prescott G 2 " Oct. 27, 1862 Removed from Smoketown.
" C 151 " Reed, Israel S. I 2 " Mar. 16, 1863 Removed from Frederick.